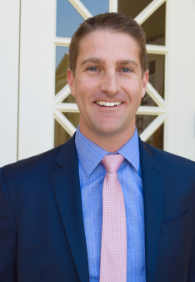 Originally from Denver, Colorado, Armen graduated from Chapman in 2006 with a degree in business administration from Chapman’s Argyros School of Business and Economics. After two years of working in Admissions at Chapman, Armen decided to return to the Argyros School to earn his Masters in Business Administration completing his degree in 2010. As an undergraduate student Armen played lacrosse all four years and served as team captain his senior year. He was also an active member of Greek life during his time as a student. While pursuing his undergraduate degree he coached youth soccer and lacrosse teams as well as worked at Wells Fargo Bank. Currently, he is an advisor for the men’s lacrosse team and the women’s lacrosse team at Chapman. I think that it is absolutely imperative for students to get as involved with their community as possible. However, this is not to pad the resume. Sure it looks great to have leadership roles listed on your college applications/resumes and we DO value these greatly in our decision process but the life experience that you generate from your involvement is where the absolute value resides. Involvement in your community will shape the character of your life more than you would ever imagine. Service and involvement will continually enrich your life and that of those around you. Also, think specifically and act genuinely throughout your college search and application process. This changes on a seasonal basis but overall I’d have to say the entire Lastinger Athletics Complex. I never had the opportunity to enjoy these facilities as a student athlete but I’m certainly reaping the benefits now as a fan. There is something truly special about NCAA Division III and club athletics. The Lastinger Complex is a beautiful home for panther student athletes and fans. The passion for sports is never forgotten, the competitive spirit can thrive, the value of teamwork is instilled, and leadership is earned. Fostering strong and lasting relationships with the students and families that I have worked with over the years. It seems like the streak will end at some point but I’m still in touch with several students and their families from my first graduating class (2010) and continue to be blown away by the wonderful people that I am able to work with year in and year out. Chapman has always been special to me but nothing beats opening up our window of opportunity to future generations of aspiring alumni. I hate to go jock here but I have to. My entire Chapman experience has helped shape me into the man I am today but playing for the Men’s Lacrosse team iced the cake. Traveling with the team was always a blast but one trip in particular really brought things full circle for me. My Senior year we traveled to Florida to play University of Florida, Florida State, and University of Central Florida. This was my last trip as a player that I would make and in fact the final game was also the final game of our season and my career as we did not make the playoffs. The coaching staff took us to Wakulla Springs State Park for some back swamp gator watching and lake swimming (yes these bodies of waters were connected and we saw 15 ft. gators! Can we say sketchy?). Anyway, in the final game of the season and my career at UCF I happened to come down with a 103 degree temperature (this may or may not have had anything to do with Wakulla Springs) but it was the last game of my career and I had to give it a shot. Mid-way through the first quarter I realized that I was not going to make it much longer and it was about time to get my final goal and get off the field for good. Fortunately, I won the ensuing face-off, ran down the field, shot, saw the back of the net shake, and got off the field only to ask my coach if my little brother (a freshman at the time) could take my spot. He responded “I was going to do that regardless”. Best part was that as soon as my brother stepped on the field, he scored his first collegiate goal. In a moment where I couldn’t feel any worse physically I couldn’t have been happier and more proud of my brother, my lacrosse team, and Chapman University.